I'm moving to Austin. It looks like Chicago is overrun with women. How typical! Maybe I'm using too broad of generalities, but I see a bit of a pattern--Austin and San Fran, large single men populations, currently large gay male populations. 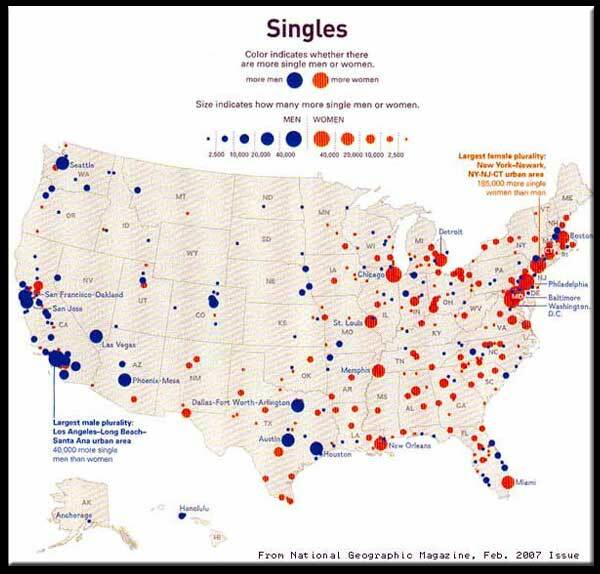 New Orleans, Chicago, some other urban areas--possibly the large single women rates there are related to single mothers raising their families on their own? Those are good questions, TG. (Have you thought about law school?) I was asking the same sorts of questions. For example, if we had breakdowns according to ethnic groups, would we see something we don't see with the map as it is now? What about demographics-if the populations in a given city are older, would the figures naturally skew to women, as they live longer? The map is from the February 2007 National Geographic; I'm going to try to find that issue and see if there is some explanation. What if guys were looking at this map and, at the very same time that girls are packing their bags, the guys are packing their's? Then, in two years, everything is completely reversed. Fat chance.